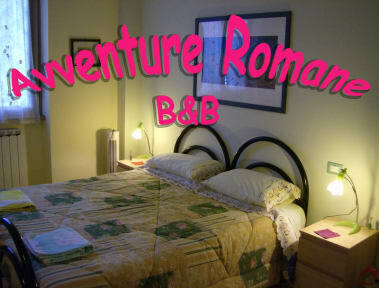 Avventure Romane B&B i Roma, Italia: Bestill nå! For a business trip or if you are simply passing by choose Avventure Romane BB where you can find a familiar environment, informal and comfortable for your nice adventure. The place is just perfect: no urban chaos, but nevertheless very well connected to the historical downtown and the shopping centres as well as business centres and the main ways of communication. Thanks to the proximity of the line A (the red one) of the subway, with 'Via Tuscolana' (a long street full of shops) and the 'Raccordo Anulare' (the highway that surrounds Rome). Located at the ground floor in a quiet block of flats, with an internal tree-lined courtyard. Completely restructured, it consists of two nice rooms for the guests, both with private bathroom, TV, Fan, exc. It is possible to have breakfast in your room at the breakfast corner: continental breakfast, with warm beverages (tea, coffee, milk), juices, cakes, yogurt, cereals and bread with butter and marmalade or chocolate. No smoking in all the Avventure Romane B&B.